Why use Andrew Lock to inspire and motivate your team? Andrew specializes in creating, leading, and managing teams in highly adverse and uncertain environments. Precisely what organisations are facing in today’s constantly and rapidly changing financial, political and technological world. Andrew Lock is not just a mountaineer. 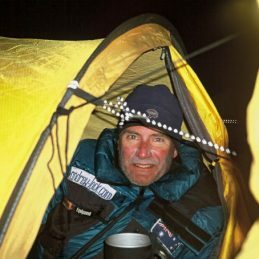 In addition to being the only member of the British Commonwealth to have climbed all fourteen of the world’s 8000 metre – death zone – mountains and being the first Australian to lead a commercial expedition to the summit of Mt Everest, he has led over 100 exploratory, research and remote area teams to every continent on earth, for private entities, government and the corporate sector. Additionally, he has worked in both State and Federal public sectors, emergency services, military and the private sector. All of Andrew’s presentations are inspiring and leave his audiences completely wowed. He was officially named one of Australia’s 50 greatest ever explorers, awarded an Order of Australia for his services to adventure and received a Commendation for Bravery for rescuing three climbers from near the summit of Mt Everest. But it is his ability to draw clear and relevant linkages from those adventure experiences, combined with his extensive workplace leadership roles that will provide your team with practical lessons to take your organization to the summit and beyond. This is why Andrew is repeatedly asked to return and present to leadership development programmes for some of Australia’s largest corporate entities. SUMMIT 8000 – The Longest Climb. Alternatively, Andrew will develop a specific presentation or workshop unique to your organisation’s priorities – Leadership, Teamwork, Risk Management, Culture, Resilience, Motivation, Goal Setting, Planning.